NEVER USE ANY PICTURES FROM THIS SITE FOR YOUR EBAY OFFERS! This is a copyright violation as well as unfair towards those who are bidding on your items! Each and every object being displayed on these sites is owned, photographed, programmed, sampled or scanned by myself. If not, sources are mentioned explicitely. I don't take charge for the correctness of all contents. Feel free to correct me if necessary. The Simmons company and its founder David Simmons are considered to be Pioneers in the edrum history. The idea of reproducing drum sounds with analog synthesis was not new and already existed for a couple of years, when David developed the hexagonal shaped SDSV pad. The design of these pads fitted perfectly into the rising MTV age and where resonsible for the incredible success of the company in the beginning of the eighties. Of course the competitors like Dynacord, Roland, Yamaha, DDrum and Pearl wanted their piece of cake. Some companies where also interested in buying the Simmons company. David Simmons is pretended to have left the Japanese guys from Akai outside his door when they came with a big big suitcase full of money in order to buy his company. Simmons countered with some successful products like the SDS9, the top-selling Simmons set ever. In 1986/87 they had to decide where the way should lead to: high-end or low-end consumer equipment. The answer was the SDX, in my oppinion the biggest step in edrum development until now. The operating system has been programmed by Simon Davidman who already programmed the SDS6. It was introduced in 1988 during the Frankfurt Music Exhibition (particularly that was my SDX: serial number #019). Unfortunately it was expensive like a new car and drummers have not been so familiar with computers. That's why it only made its way into the recording studios of a handful of rich and famous producers. Only 250 units had been build and I guess only around 50 SDX's may be still in working order today. 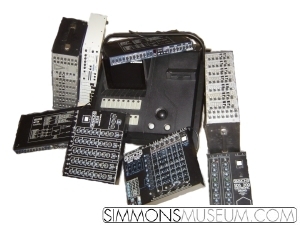 Some more consumer products had been developed like the turtle trap midi controller, a midi mallet, the Hexahead pad generation, Drum Huggers, Hexa Bugs before the Simmons company closed forever in 1994. But everybody who has witnessed the eighties remembers these hexagonal shaped drum pads. Since Octobre 2006 new series Edrum kits labeled 'Simmons' are available. These kits have nothing to do with the historic Simmons drums. The truth is that in 2005 'guitarcenter.com' caught the name rights of "Simmons Electronic Drums" and now labels a cheap toy-like far east drum kit with the old Simmons logo. During the last years I found out that some former more or less important Simmons protagonists seem to have "different truths" concerning the time after 1988, they partly emphasised their interpretation of the story in a more or less "offending" way towards me. Therefor I prefer to refrain from reporting about the company's history more than necessary and focus on the so called "happy times" until 1987. I am not up to company politics and prefer to confine to report about Simmons gear and events. Two reasons why I programmed this site: First of all I can take a look at my beauties where ever I am. Second: If you got a treasure, it's double fun to share it with others. I am a Simmons nerd from the first time. In 1983 at the age of 13, I travelled to London only to get an SDS 5 flyer although knowing that I would not be able to buy one in the near future. So during the eighties I only bought an SDS200, well, better than nothing at that time. Inspired by the title of a vintage "Modern Drummer" magazine in 2004, I developed an excessive passion collecting these nice items I dreamed about 20 years ago. This passion finally lead to tons of Simmons gear. Likely I spend more time polishing pads than actually playing on them. Personally I have been always fascinated by the hexagonal form of the pads. I never cared about other edrums but Simmons. I never used them live (but the SDS200 once at school 20 years ago) and probably I never will. I rather prefer to keep them in a great shape or to bring old or broken gear back to life. I will look after this site. Every new item will be photographed and presented here. Once a while I add an area (as long as scroll bars in browser windows will last) with various content that might be interesting for you (at least for me). Many thanks for your visit!!! Thanks to my wife who tolerates my passion with great patience and who gave us the sweetest twins!